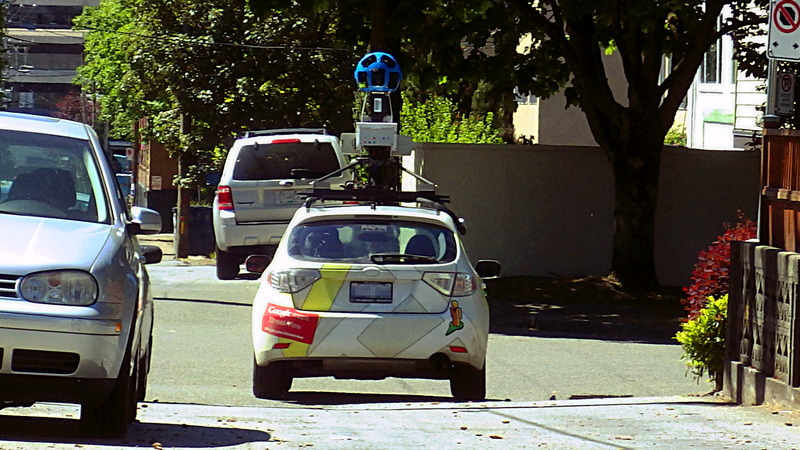 camera car, Google Maps Street View, Vancouver B.C. Street View car exiting alley between 10th and 11th Ave. onto Alder St.
Four days ago, on May 5, I saw a Google Maps Street View car speeding eastbound through the 1400 block of West Broadway Avenue. This was at 2:13 p.m. as it passed me going west in the 1100 block of the back alley between 10th and 11th Avenue. It exited the alley on Alder Street, turned right and I lost sight of it. 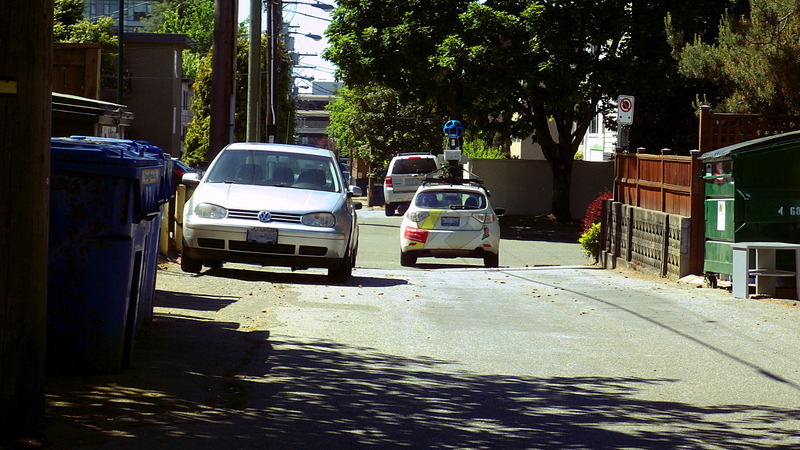 It was two years ago, on May 1, 2014, that I last saw and photographed a Google Maps Street View car in Fairview. That time I was lucky. I photographed it first in a back alley and caught up with it again a few blocks later stopped at a intersection. I only managed to get one photo of today’s Google Maps Street View car but it was enough to tell me that it might as well have been the same one that I saw two years ago. It was the same model of Subaru Impreza, with the exact same markings and camera mast. It also had Ontario license plates which shared the same four letter prefix as the Ontario plates of the 2014 car. However, that’s as far as the similarities went. The last three numbers of the license plate were definitely different. Click the images to enlarge them. I love the idea that there’s now a Google street view photo of you taking a photo of the Google car. It’s Google inception!